Happy New Year to everyone - we are off to the movies to see Marie Antoinette before we go to our friend Liliana's for New Year's Eve. Ian has to get up at 6am to take Bruce and Kazuko to the airport as they are off to NZ tomorrow - a whole day's flying all ove the country with Virgin Air before they land in Wellington where lucky Ken on his brithday will collect them from the airport around midnight. I have been busy today working away and Ian has been busy loading stamps onto the web but we did manage to sneak up to The Beaufort Street Merchant for coffee. After all it is a holiday. Ian has a very sore arm and I think it must have carrying that 2 volume christmas present home for me...... Worth it though. Here is my Waiheke journal - embellisher made - now I have to work on the inside pages. My little effort for today - I have been on a slow-go - it must be the holiday season or the hot weather or something. 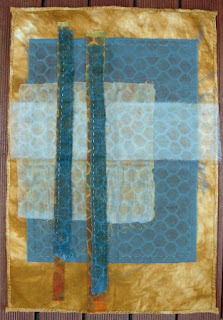 This is one of my two pieces for the Quilt Convention in Melbourne - almost all on the embellisher. Having fun with these little houses. The size is 40cm x 30cm. I am not one for mega quilts...... The second one will be about the same. In the paper it gave the post office opening days. Today they were closed except for the GPO and some 'main' ones. As ours is a Central Business Sorting Centre, you might imagine it would be an opening one but not so. Ian was going to have to go into the GPO - not easy for parking and lugging but we decided to put everything into red bags so he could post in the boxes. In their wisdom our branch has decided that from 1st Jan it will now close at 5pm instead of 5.30pm. Currently we do the mail so that Ian can whizz down at 5.20 so now it will mean we will have to start a half hour earlier and we won't be able to do those special late orders any more. Sorry folks - you will have to email by 4pm now at the latest. I am waiting to hear about the chaos at 2 minutes to 5pm from now on. My art to wear for 2007 is underway - one cami almost finished and the bolero underway. Decided to make my own pattern up after all of that - this is my tv knitting. The other night we went out with Frank and Sarina to That Mexican Place in North Perth - highly recommend it - really good Mexican food and service to match. went to a great film last night - The Queen - Helen Mirren is indeed a good actress and it was interesting to see a film portraying people who are still alive. It would be interesting also to know how much of the script was for real. I had actually forgotten the huge impact that Diana's death created and the events of that week. I am used to seeing Helen Mirren as Jane Tennyson in Prime Suspect. Another film we are looking forward to seeing is Marie Antoinette. Boxing Day is not just for the cricket at the MCG and the Sydney to Hobart yacht race but also a busy movie going day. We went to the wrong theatre first of course so took our books and wine down to the river to fill in the time before it was on at the proper place. I got 2 fabulous books for christmas, both full of lots of wonderful resources. I have already thought of some special to add to my garment for 2007. The first is Knitwear in Fashion - this was from Grant and it is full of all sorts of familiar and pushing the boundary stuff. The pic on the front cover is of Kate Moss. Took me a while to recognise her. The second one set of 2 books probably almost broke Ian's arms as he walked home from town with them on a hot Staurday just gone. 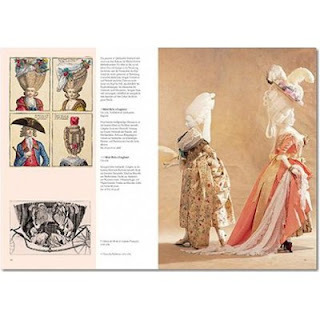 It's the 2 volume Fashion - a history from the 18th to the 20th Centuryfrom the Collection of the Kyoto Costume Institute published by Taschen. 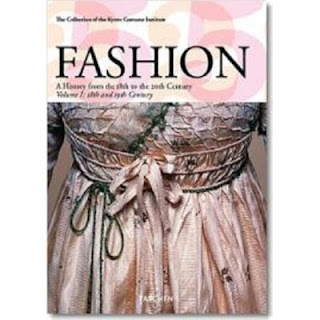 It's a wonderful collection of fashion which I know I shall refer to for ever. The first volume starts with stomachers so my little brain is festering with ideas - for later. Bruce and Kazuko gave me black agapanthas for the garden - I am very fond of them and now that the scaffolding is down we will be able to clean out the rubble. We had a lovely christmas day - it was 34 (lucky people in the eastern states had rain and snow depending) and we ate outside but we survived. Too much food but not overindulgence on wine as too hot. Today - Boxing Day - is even hotter and we have been incredibly lazy although I have been working on my camisole - and then we are off to the movies. Hope everyone else is having an excellent and relaxing time - where-ever. newsletter no 38 - stretching the limit. Well we just got the newsletter out in the nick of time. I am going to have to do better next year - some people whizz one out each week. I don't know how they can do it. When I started writing them, there were hardly any around and some businesses charged for their newsletters. We do try to make them interesting. If you aren't on our mailing list and want a copy, just email us. Ian was up at 6am to go and get the meat. I spent an hour queued up to get the prawns (so I bought a crayfish for our dinner tonight as a reward). The shopping is all done. The icecream is made, the summer pudding is made (with our mulberries), the pavlova is about to be made, some purple onions are about to go in the oven to roast before some tomatoes join them, the presents are all wrapped (and at last I see some for me under the tree selfish person that I am) and in the morning we will light the webber and get ready for our outdoor Christmas feast. It is going to be 35degrees but I am delighted for the people in Sydney with rain and Melbourne with 16 degrees. Sure is a strange world. For those in the northern hemisphere, hope you have snow. In fact where-ever you are I hope you have a wonderful relaxing day. this is our waiting to be planted Cordyline, resplendent in coloured lights. 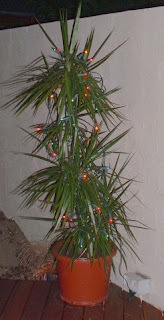 Here is our Xmas tree from 1970 still going strong. And outside the studio something I bought many years ago awaiting their opportunity. It's 6 days since I added the neocounter with flags and countries and there have been 1010 visitors in that time. Thanks for reading my musings - it keeps me on my toes and now that I think we have slowed down - today wasn't so hectic - I shall be up early for my walk, breakfast and then off to finish my christmas shopping and stuff and into the studio to work. 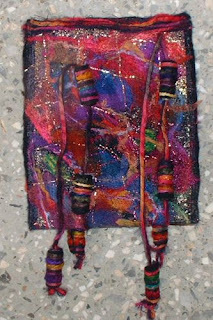 Sarah Lawrence has been making some wonderful wild women so I thought I would make a litle bag for our mobile phone. Ian will be delighted every time he uses it..... I used the Artgirlz charms - they are such fun and I have even painted their nails with Pinata Inks. If you look at the lefthand side of her you can see some of that twin needled velvet from Princess H. All on the embellisher with some handstitching. Got all of the Cloth Paper Scissors away along with lots of other parcels and we had a pile of visitors so we had a busy day. 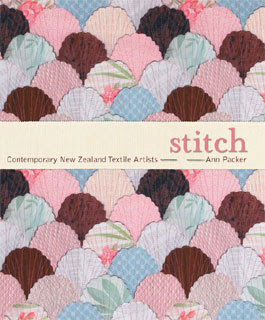 I have been reading this book - Stitch - a fabulous anthology of NZ textile artists. Why haven't we got one in Australia? I would highly recommend it. As I type away in the studio, the Salvation Army are out doing their yearly Christmas Carol playing. They have a hostel over the road and this has been a yearly event since we came here. Read that the Tallis Scholars are coming back to Aust with a tour in Feb so I whipped on the internet and got almost the last tickets. I would have cried if we had missed them. Like everywhere else in Australia I expect, it is very hot and humid here, and to be so right through. When we came to Perth in 1978 it was hot but not humid - now we feel like we are in Singapore watching a video of Perth. Ian and I go for our morning walk as early as we can (not together) before we melt from the heat - not that melting would hurt me. Off to dinner with Malachy and Eva, our Irish mates. 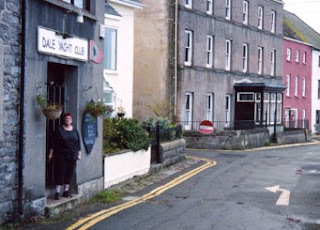 Here is the photogenic beauty outside the Dale Yacht Club. 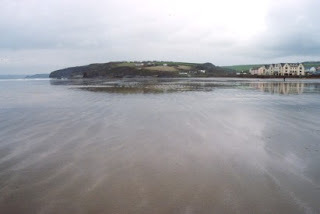 These two pics are of Broadhaven Beach where we stayed. The tides were amazing and the beach was always full of people and dogs. 3 drops of rain does not become a thunderstorm. The weather bureau needs to do better. Grant arrived in Perth today so now we are all here and I have christmas fairy lights in the studio and tomorrow I will put up the christmas tree. You will be amazed - it did cost $4.99 back in 1970. I am fascinated with this list of countries - if they come back I might find out what the countries out in the ocean are. 'Craft is where you take the parameters and work within them. Art is where the medium is stretched to breaking point and emotion is conjured up.' A quote from Malcom Harrison, 2006. 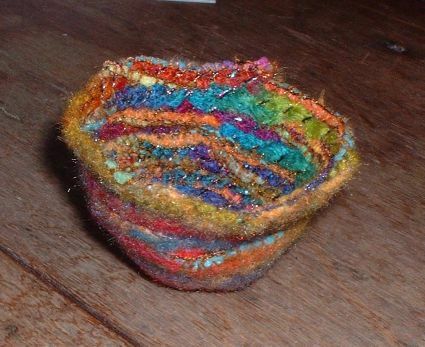 NZ textile artist who happens to live on Waiheke Island. I think it says a lot. Very hot here this weekend with a promise of a thunderstorm tonight. We have wiled away some of our time watching the cricket where it actually became exciting this afternoon. Cricket doesn't do a great deal for me - sort of like watching grass grow (okay I know there are plenty of cricket fans out there). 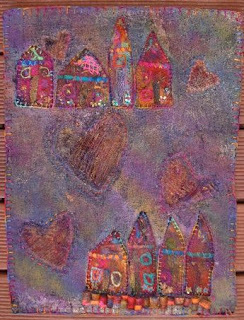 Because I am a tutor at the Quilt Convention in Melbourne in February I have to exhibit 2 pieces (note I didn't say quilts). 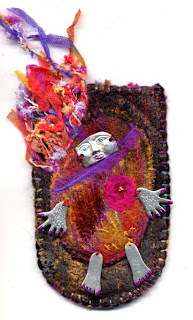 I thought I would challenge myself to create 2 works primarily using the embellisher with mixed media and hand stitch but try not to use my sewing machine. Rule broken already because I want to twin needle some of the left over velvet from Princess H. Mad as usual. I intend to include both pieces in the book. I have decided on my art to wear garment for 2007. It shall be titled Goody Goody Gum Drops. This is because Ian had an icecream of this name on Waiheke and I only had rum and raisin. I whinged but I didn't get a taste. So I am going to be involved one way or another. I want to knit a bolero but I can't find a pattern that I like. Looks like I will just have to create my own. I am hoping to work on the bodice (cami) tomorrow. This will definitely be made on the embellisher. This little piece has all been created on the embellisher. Leave it for you to work it all out. Nothing complex. Off to eat up the road. 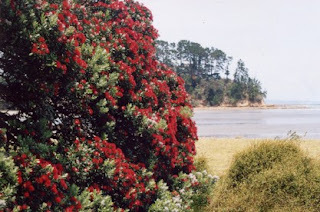 This is one of the many Pohutakawa trees out in flower on Waiheke Island. 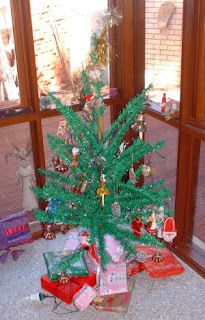 It's known as the NZ christmas tree - at our last house our neighbour had one in her garden but it didn't ever flower. It is commonly seen in the north - lovely red flowers. One of the many lots of grapes growing on the island. Very stitching pic. Note one of the many vistas of water in the beyond. I have frittered away some time loading a counter with countries and flags. Doesn't seem to like my laptop though. The fires in Victoria and Tasmania and the lack of water is a big discussion point at present. And they will stay with us through the summer. Not all fires are from natural causes - many are lit by arsonists - what goes on inside people's heads never fails to amaze me. One thing about textiley folks - 99.9% of them are wonderful. Great scene to be part of. I have been having more fun with my machines - slowly making progress but I am happy to show people my studio when they come round since I am so spoilt. For two days there has been a rosella in the branch of the mulberry tree just outside - resting from the sun and no doubt with a tummy full of mulberries. Happy to share the top ones. I just collect a bowl full every day - freeze some, have some with icecream and thanks, Penny, I shall make a summer pudding this weekend. 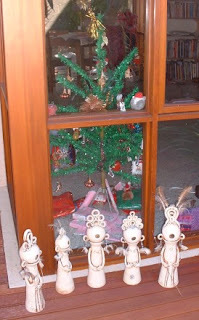 Ian has loaded a pic of the Western Australian christmas tree on our website - if you click on the holly branch and bells pic, you will see it. In our last house we had such a tree in the garden. Also heard this morning that the latest Cloth Paper Scissors is on its way - maybe before christmas. I am working up in my studio and I think I must be one of the luckiest people around. This is the mulberry tree which is just outside the window. 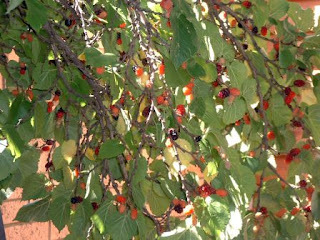 It is laden with mulberries and they are sweet and so tasty. 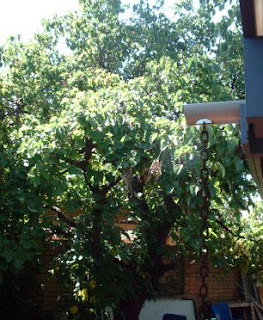 When we bought our house the mulberry tree dominated the back area of the back garden surrounded by other things which never did well. When the studio was being planned, we asked Paul to design it around the 2 eucalyptus trees and the mulberry tree. Well the eucalyptus trees have a prominent place but the mulberry tree has sort of been pushed out of the limelight. One of the first things we had to do was to saw off one of the branches and you may have seen me in action on our About Us page on the website. You can't see it so easily from the back garden anymore but inside the studio where I am working (2 embellisher machines facing out), I am looking onto this superb vista of green leaves with light filtering through. Absoluetely laden with nulberries in various stages of ripeness. We still have to clear up the area underneath and I am hoping Ian will agree to water of some sort but it will be a pleasure to watch it develop. Outside it is supposed to be 32degrees (and it feels like it) but in here it is cool, helped no doubt by the high ceiling and polished conrete floor. I haven't had the air con on yet either. I am truly a spoilt person. Ian can skype me any time especially to tell me the coffee is ready. All I need now is a sound system. Our stained glass window came back from hospital today - all fixed and ready for another 100 years or so. 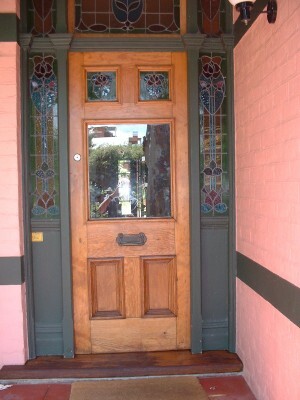 It is all clean as well and what with the door being all painted, it looks a great treat. Penny - the camera bag yesterday had no stitching on it - just embellished with both machines. Today's little effort the same. I am trying to create things without using stitch although of course the embellishers are a supplement to the sewing machine. Moving onto that soon. The Janome is different to the Embellisher - it has 5 needles instead of 7 and the needles are set higher - taking me a while to get used to it but Maggie Grey tells me she has broken fewer needles on the Janome. It is also noisier and runs slower - technical details will follow. I think the price makes it highly comparable and like sewing machines one will have one's favourite - both are working very admirably. 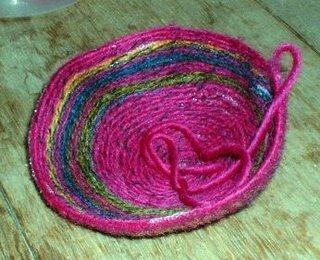 I have broken needles today on the Babylock - when you whizz around in circles you simply must not pull the fabric - you must release the needles - okay? Luigi and Martien have arrived an hour earlier so off I go - promise that the newsletter will be ready to go out tomorrow. Just where does each day go? I have made a bag for my digital camera for when we travel to protect it. I will soon forget how to thread the machine needles soon if I don't get back to my sewing machine. There is something strange about this pic - the cords should go over the other way but never mind. I have made beads by couching down yarns - very easy way to make fabric beads. Now I am making another piece - maybe a sample book cover. Talking of which - hope you have all visited workshop on the web to see how the books for auction are going. It closes at 12noon and now we have daylight saving I can't remember how many hours we are ahead. Watched the first half of the last Prime Suspect last night - very good. 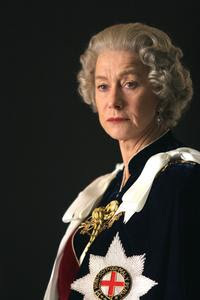 Helen Mirren is a good actress and I also see that the film about the Queen which was showing in London when we were there but didn't see, is opening in Aust on Boxing Day. 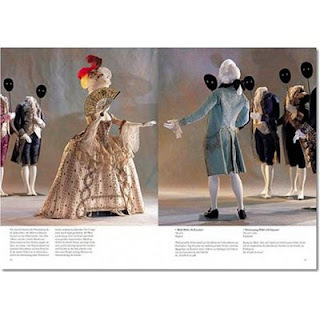 Looking forward to that and also Marie Antoinette which was on in London too. Why does it take so long for films to get here? Ian has loaded most of the monthly specials today (yes I know it is the 10th but we are always late) and he hasn't added it yet but for all orders over $50 I am sending a decent gift of hand or machine threads. (or even both). I am trying to clear some space for new things and things which have nowhere to go. The Zap Cloth and the 25kgs of sequins and a few other things will be here probably before Christmas. Off to Luigi and Martien's restaurant for a lovely meal. Ian is busy laying bricks. As soon as they take the scaffolding down next door we will be able to bring in a mini skip. If we have one delivered out on the verge you can bet that it will be filled with other peopl'es junk before we get the first wheelbarrow load out. this is a sunset on Waiheke Island - not while we were there as it was very windy but taken the day after we left! The people where we stayed told us that it changes every day and while it is happening. Here is the view from Mudbrick where we went for our anniversary dinner. See what I mean about Tuscany with water? We didn't have that view as it was raining heavily and the doors were closed but last year when we were there we went for lunch and it was so glorious that that is the reason we went back. Rain didn't last long and it's back to summer again. Off to the studio to work. I picked up the Xpression yesterday and had a little play so will be working on both machines this weekend. They feel quite different. woke up this morning to RAIN, RAIN, RAIN. It won't last (in fact its 7am and it has stopped) but what bliss. The smell is glorious. The seat cushions outside are wet but they will dry. Someone from Brisbane emailed to say it was raining at her place so I hope everyone else in OZ has some/gets some soon. 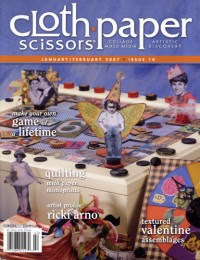 Too early to do the code but if you go to quiltingarts.com and click on quilting arts mag and on Pop Goes the Card Case, you can see my card holder thingie which didn't arrive in time to be in the mag - postal services can be annoying but that's life! If mothers can't brag then who can? This is Bruce's award winning photo - one of the things he does is to take photos at WA Aussie Rules games (WAFL) and he won an award for this little number - I am not sure what the name of the award was but you can bet I will tell you when he tells me! For those who know about Aussie Rules - that is Michael Gardiner at the top - he used to play for the West Coast Eagles but I think he does not now. I also think we might have some rain tomorrow morning - hope everyone else in Aust does too. Ian has just had his phtos from Wales developed and the contrast beween the beach at Long Haven and on Waiheke is very interesting to say the least. It is always my imagination that I will get things done for me when we come home after being away - I should know better. When you have at least 4 days orders to get through and a packed up answer phone...... Not to mention the parcels and mail waiting. At least we have some daylight saving now to make life a little more like the rest of the world. It has taken me until 6pm to locate my studio key so I can go in and see that the stuff I left all over the place is still there waiting for me. While we were away I bought a child's book with a hard cover at the markets and I glued the pages together - well only every second one and then I glued some Waiheke newspaper pages and brochures on the pages and painted over it with gesso all ready to use as my Waiheke sketchbook. Of course each page takes a while to dry and I didn't actually finish the gesso part but in my little tiny sketchbook I did little tiny drawings and with my photos will work up to using it as I planned. The green grass for all of you in Canberra especially, is real. Can you see why my soul is settled for a little while. 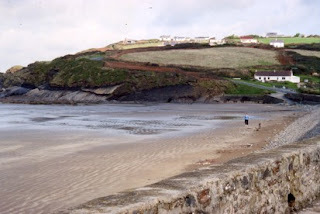 I just loved the land and the sea all around - loads of beaches and we very busily found where we would like to stay next year - yes - next year. I would love to live there but Ian has (very wisely) pointed out the impractical nature of this. But I do plan a long term decent amount of work to come out of it. I have even bought home the newspapers and extra brochures as I am sure I will need them and I found some wonderful paper napkins - well they are more a map of Auckland and the Hauraki Gulf but I think highly appropriate. So lots to share in days to come. I didn't do much writing for the book but I did make a lot of notes and tomorrow I hope to get back to the embellisher. I will also go and collect the Janome Xpression I am going to borrow to see how it performs. I have plenty to do for sure. Today along with lots of other stuff, the Creative Quilting book arrived. 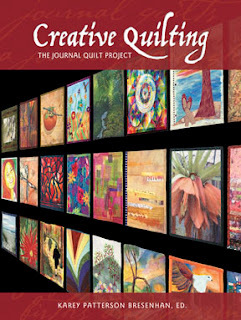 It is a huge book - nearly 300 pages and has a wonderful selection of journal quilts contained. Quite yummy. If you are a WOW subscriber, you can see the book aid auction which Maggie is running - someone has actually bid for my Aussie scroll which is wonderful - I hope it goes to a good home. I seem to have mislaid my mediaeval scroll - I will have to make another one - maybe a Waiheke scroll. This is Stoney Batter and typical of the wonderful scenery we saw. We have a small warehouse just down the road and we have the most eclectic neighbours in a block of 4. 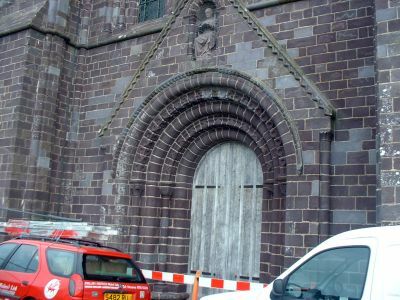 Christian Youth is next door to us, a stripper shop is along the way and on our other side there have been various different tenants who come and go - they spend a fortune on telephone lines (the connection is in our warehouse so that's how I know) and then they move on. The lastest people run a nightclub bouncing business (I am sure they describe themselves in a much more salubrious manner) and their various phone lines were quite involved. However they have now gone as the guy running it lost his licence - not suitable or something. Wonder who will come next? We just have stuff piled high and I run in and out collecting and dropping off. 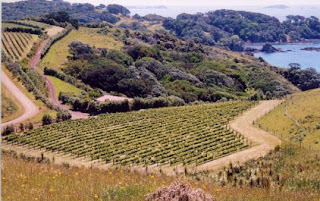 Should have said that Waiheke Island is off Auckland - 45 minute ferry trip - I have packed my 'puter so should return with a newsletter ready to send out and a book moving along. I am also taking all my usual paraphenalia. This is another pic I found. Very wet last night - lovely - we surely need it. Do you remember how we used our points to get an upgrade from Singapore to London and were 3000 points short of being able to try for the return trip? 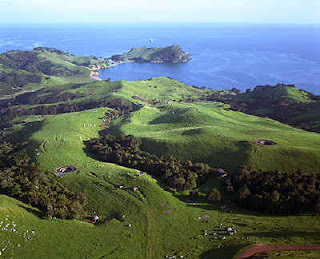 Well we have accumulated more since then from the fact that we paid for that trip and one to Melbourne, and because it is our wedding anniversary on Thursday and my soul is hungry, we are sneaking off to Waiheke Island for a few days leaving tomorrow night. 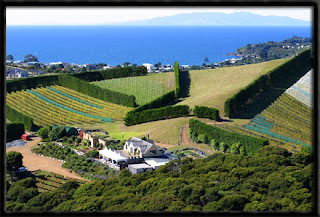 This is Mudbrick Vineyard and Restaurant where we are having dinner on Thursday night. 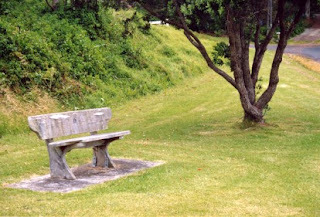 You can click on Waiheke Island in my links if you want to see more. It is my favourite place - and sitting eating at the Mudbrick is like looking out over Tuscany with water. We got all of the Quilting Arts out today - Ian had to do two trips to the post office there was so much mail. Now we can relax and go to our local The Brisbane with our friends Eva and Malachy who haven't actually made the last two weeks - third time lucky. It has been trying to rain all day and finally it has started - very windy but still warm. The latest issue of Quilting Arts arrived this afternoon but don't ask me what is in it as I have been too busy processing as many as possible to get them out. Nearly half way through with the rest to go tomorrow. Exciting to see it arrive but always exhausting getting them posted. Caitlin asked about our window. 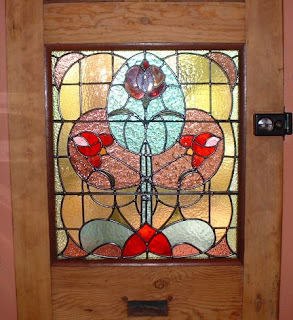 The stained glass, which is probably original (house is circa 1895), was coming adrift. I think the guy before us had done his own botched job of soldering and with the banging shut of the door and general ageing (we have been here 14 years), it was very flexible to say the least and in danger of actually falling out. So that's why it's in surgery.... When it comes back I will indeed take a pic from the indoors and post it. Ian is very busy sanding and sikkening the door in preparation for the return of the glass - he is going to put some of that nonreflective stuff on it in the meantime. You can imagine how much heat it is letting in especially with the temperature at 30 yesterday and 32 today. 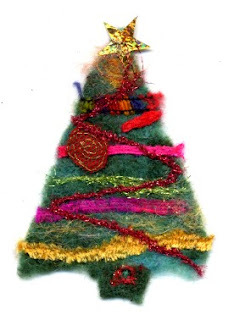 I have been embellishing on kunin felt and burning and writing and winding silk thread. 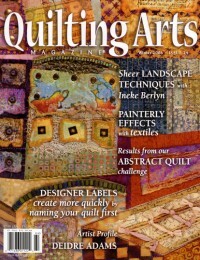 Quilting Arts 24 didn't arrive on Friday as we hoped but it can't be far away. I believe I have some work in it. On Friday night I went to the opening of the Designing Women Exhibition - Multiple Threads. There was some wonderful work on display - and in fact I think it is one of the best exhibitions I have seen in Perth - everyone involved is to be congratulated. If you are in Perth - well worth a visit. Old Royal George Gallery - cnr George & Duke St, East Fremantle until 3rd December. 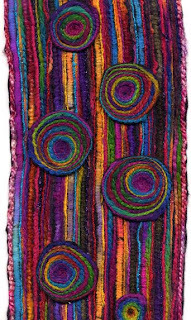 In February we are hosting another ATC Challenge - this time at the Australasian Quilt Convention in Melbourne. Once again it will be a Make 5 Take 5 so if any of you are of that inclination, do take part. The Celebrity ones will be on display again too with a few new celebrities I have forced into sending me some ATCs. After that I will send them on their way. This is just a pic of 6 ATCs I made earlier this year on the embellisher. 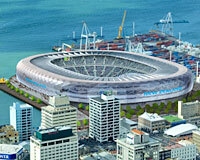 I see that the Auckland council have voted in favour of the waterfront stadium for the 2001 world cup. It looks impressive but I wonder if it will detract from the beauty of the waterfront - you sortof associate rugby in Auckland with Eden Park. I imagine it will be the talk of the town for some time. Embellishing away some more today - enjoying developing more ideas. 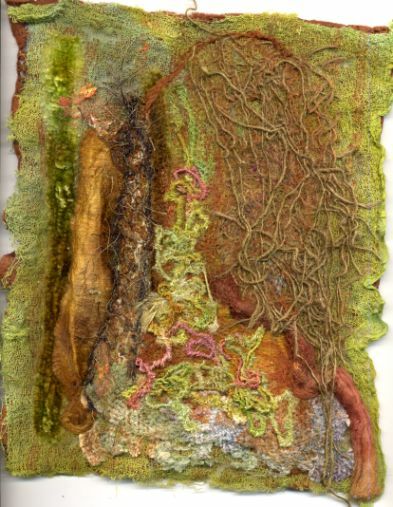 I got quite enthused and today wanted to experiment with natural fibres - different scrims, silk rods, mulberry bark, thick rayn floss, silk velvet (yummy) - messy looking sample but I am pleased with the experiment. Last night some friends we haven't seen for ages, came to visit. Graeme and Delys who used to have Millhill books - they are over for a holiday. We had a nice meal out at the Brisbane but beforehand, Paul came around with the photographer for another round of photos - the last ones were no good apparently. The entry for the national finals had to be in today. Hopefully he will send us some and we can pop them up on the web. Took enough. I decided to take my 'puter up to the studio this afternoon and watched the Jan Beaney dvd off and on. 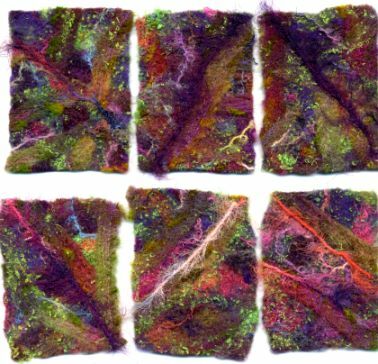 Jan talks mostly about how she works on water soluble creating her cloth. I was interested to see that she used a hoop. I hate using hoops for free machining. She also talked a lot about her yummy sketchboks. Many thanks to everyone who sent me names - you have no idea what a help it was, followed by a lot of choosing. 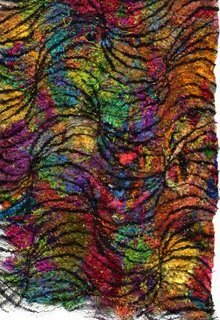 We spent a lot of time tossing your ideas around and decided to go with The Opulent Collection which came from Sheeprustler who I am pretty sure is Judy E? Just confirm for me will you? And for the thread set we decided on Royal Shiraz. Shirley Wager gave me Shiraz and we decided to add the Royal. 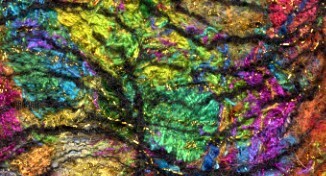 So many thanks and as soon as the threads are here, I will send you each a set of the variegateds. I am looking forward to this collection coming - definitely my colours. I will be having some lovely opulent fabrics, threads and laces and silk and wool fibres to go with it all. And velvet 'cos Opulence means velvet for sure. We have been busy today with orders but I am off to get organised for my Embellisher workshop tomorrow. I hope they enjoy it and get something out of it. 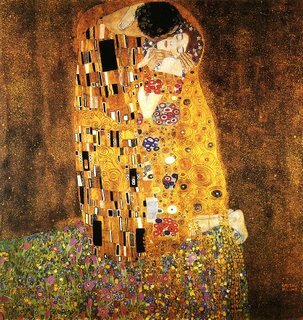 I have put a pic of Klimt's 'The Kiss' up today, because I reckon it is a pretty opulent painting. Just back from Melbourne. Of course it was very cold in Melbourne when we left here and I took warm clothes and roasted away. It was a very busy weekend in Melbourne with 2 U2 concerts on and the G20 thing. We stayed in Flinders Street and the adjacent area was all blocked off and we found it hard to get in and out. The Trade Show was good (we had no idea beforehand of what it would be like) and it was a very pleasant walk to and fro each day. The bonus was that the hotel has Fox 2 so we were up at 6am (one hour too early it turned out), to watch the ABs in Paris. Excellent result though nothing like last weekend. 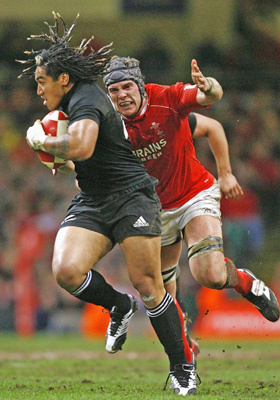 Nonu got a try which was very good. Here he is. Today we are off to Melbourne for the Australian Quilt Market which is a trade show. Absolutely no idea how it will go but we have printed info and sent small amount of all of our stuff. We haven't done a trade show before it will be interesting. Anything for a weekend in Melbourne..... Last night we had a nice bbq with Grant, Bruce and Kazuko and even got them to move some of the bricks for us - not all, note. 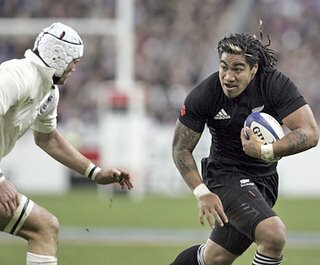 The All Blacks selection for the game in Paris has caused a few upsets but I like Ma'a Nonu so I am quite happy. I found this wonderful pic of Jerry Collins in Paris - apparently he wasn't too keen on wearing the pink t-shirt they all got. More to the point for us textiley lot, this is first attempt at some 3D using the embellisher - like making a coiled bowl but no thread, Mum. 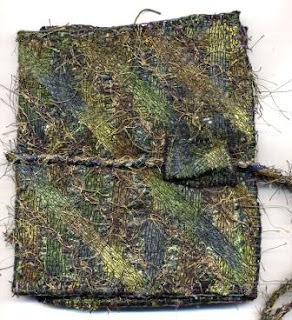 It is felted on the outside and stays like the cord on the inside - the bottom one was using a machine wrapped cord I had made previously (like the prepared food dish under the table). Worth exploring. This is case you thought I had forgotten all about Wales. Not true - I only managed to take 7 pics with my digital before it conked out. 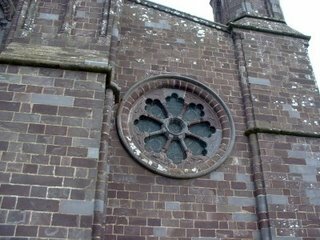 These were at St David's Cathedral - what a wonderful place - the cathedral was built below ground level in the hope that the dastardly Vikings wouldn't be able to see them from the sea. Failed miserably I believe. 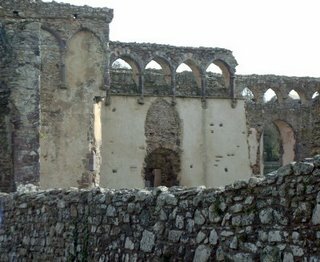 The Bishop's Palace was really special and I have seen some wonderful photos taken in different lights. I am planning to do something with all of this so will be storing them for a wee while. 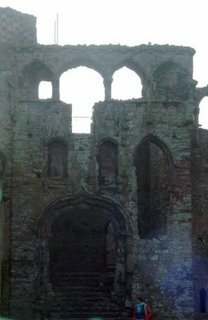 Enjoy the pics and if you go to Pembrokeshire, be sure to visit St David's. The rose window in the cathedral. One of the lovely things was that a Slovakian children's choir were rehearsing for a concert that night so we were able to enjoy their singing. The acoustics were superb. 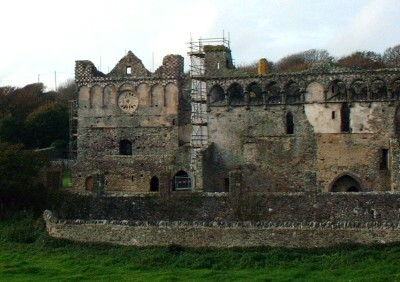 Looks ominous but there was restoration work in the cloisters in action. 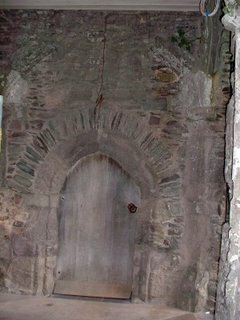 Not to mention this wonderful old door - to where?